When taking photos with your Canon Rebel T3 or T3i, you may have noticed that every light source emits a particular color cast. The old-fashioned fluorescent lights found in most public restrooms, for example, put out a bluish-green light, which is why our reflections in the mirrors in those restrooms always look so sickly. And if you think that your beloved looks especially attractive by candlelight, you aren’t imagining things: Candlelight casts a warm, yellow-red glow that’s flattering to the skin. Science-y types measure the color of light, officially known as color temperature, on the Kelvin scale, which is named after its creator. When photographers talk about “warm light” and “cool light,” though, they aren’t referring to the position on the Kelvin scale. Instead, the terms describe the visual appearance of the light. 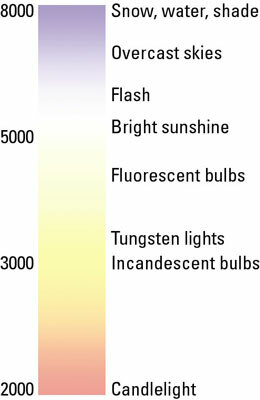 Warm light, produced by candles and incandescent lights, falls in the red-yellow spectrum you see at the bottom of the Kelvin scale; cool light, in the blue-green spectrum, appears at the top of the scale. At any rate, most of us don’t notice these fluctuating colors of light because our eyes automatically compensate for them. Except in extreme lighting conditions, a white tablecloth appears white to us no matter whether we view it by candlelight, fluorescent light, or regular house lights. Similarly, a digital camera compensates for different colors of light through a feature known as white balancing. 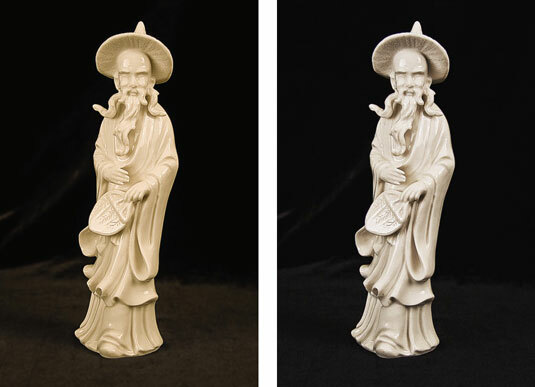 Simply put, white balancing neutralizes light so that whites are always white, which in turn ensures that other colors are rendered accurately. If the camera senses warm light, it shifts colors slightly to the cool side of the color spectrum; in cool light, the camera shifts colors in the opposite direction. The good news is that your camera’s Automatic White Balance setting, which carries the label AWB, tackles this process remarkably well in most situations. In some lighting conditions, though, the AWB adjustment doesn’t quite do the trick, resulting in an unwanted color cast. Serious AWB problems most often occur when your subject is lit by a variety of light sources. Unfortunately, you can’t access the White Balance setting in any of the point-and-shoot exposure modes, although you can sometimes address color issues via the Shoot by Lighting or Scene Type setting when you shoot in the scene modes. So your best bet is to shift to P, Tv, Av, M, or A-DEP modes, where you can not only choose different White Balance settings but also fine-tune each setting to precisely match the light that’s illuminating your subject.